I have recently grown a over-the-top obsession for a popular South Korean band by the name of BTS. BTS’ songs (with subtitles) combined, are a progression of important messages that are expressed through enticing dances and catchy lyrics. Although people criticize me for my obsession, I have good reason. BTS is able to get important messages and morals across to the youth very affectively, as many of their fans listen constantly (including myself, hehe…). BTS can be appreciated by truly listening to the matter beyond the words. Sure, there are other artists that have similar messages, but due to the larger number of members in BTS, more lines of thought are given from different “points of view” and more opinions are expressed. Aside from the messages that are beneficial to change your view on, essentially, life, their music is catchy and fun to listen to. Whenever a BTS song comes on, I am immediately filled with joy, and after the song is over, I am left with a sense of awe as to how seven completely different people’s voices could blend together seamlessly. Also, the music videos are more than enough to get your feet tapping. Their choreography is very intriguing to watch. With their quick steps and overbearing energy, that’s something that is almost certain to get you hooked. (not to mention that all seven are VERY aesthetically pleasing). BTS is a band that I feel good listening to. Their songs are catchy, leaving you humming more than several hours after you’ve heard it. The music videos are dramatic, but in a good way. The music videos have a great plot, despite it being accompanied with a song. The “plot”, when mixed with the lyrics of the song, give the listener/viewer a sense of being. Sometimes, the plot does not correspond exactly with the words, but they leave you to put 2 and 2 together to make something great out of it. Overall, BTS has changed how I perceive my surroundings, and their music is head-boppingly catchy. 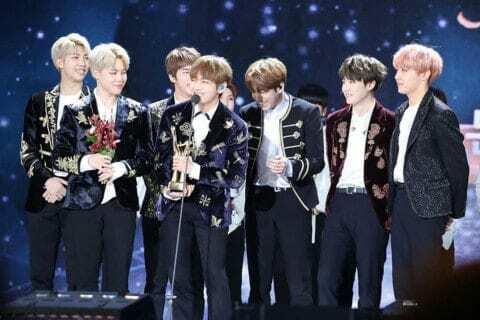 Why BTS should be heard by everyone by Krista is licensed under a Creative Commons Attribution-ShareAlike 4.0 International License. I like your post very much because I think that BTS should also be heard by the young society. BTS delivers messages that are very influential to one’s life. The symbolism in their music videos are so much more than the eye can see. BTS are one of the famous upcoming KPOP groups and they will stay at the top forever. Thanks for writing about BTS because they deserve the fame and attention that they’re getting from young people. I agree about your post, “Why BTS should be heard by everyone,” because I think that BTS is something everyone should listen to. However, I have a lot to add to your reasoning about BTS. Not only are the songs fun to listen to, but they are differnet, because it shows what the Korean language is about, and makes people think about something other than what is going on in North Korea with the world. North Korea is diminishing the value of the Korean language, and the songs get you to realize that. Also, some of the parts of the songs are funny, such as the “money” part of one of their songs. Thanks for your writing. I look forward to seeing what you write next.